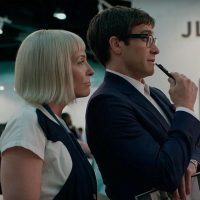 I watched the new Netflix original movie “Velvet Buzzsaw” last night and I wasn’t too impressed. The acting was good, but that didn’t save this boring film. I felt that it took far too long to set up the point of the movie. The film has a very interesting plot, but I think it could have been done better. I have been very impressed with Netflix originals lately, especially “Bird Box” but this just didn’t impress me. I give it 2/5 stars!